We were invited to dinner last night by some of Mike's friends and of course I didn't have a thing to wear lol. 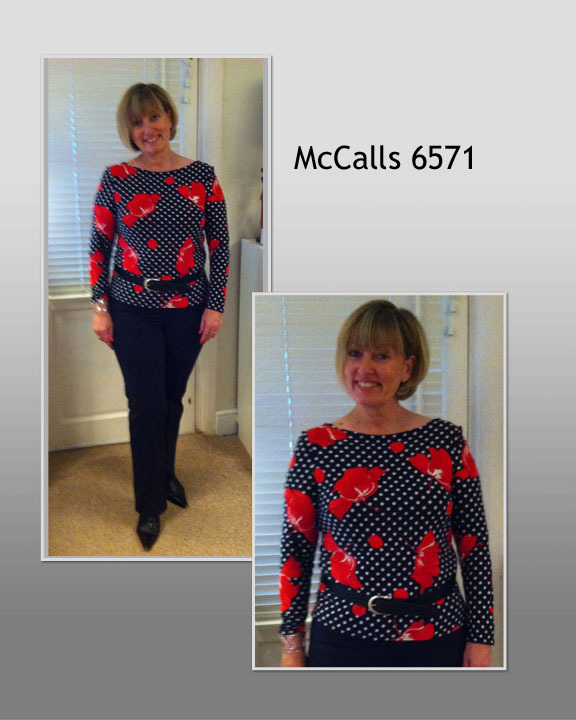 I saw two reviews for McCalls 6571 here and here and wanted to try out this great little pattern so thought it was quick enough for me to make in the couple of hours I had left before we had to leave for the dinner. This was the 2nd piece of fabric I purchased when I was with Sigrid and Clare at the sewing expo last month and it turned out beautifully. I am in love with this spandex mix fabric. 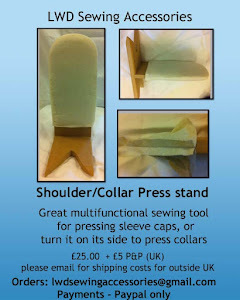 Its very light, sews beautifully (especially with a serger/overlocker) and feels wonderful on. I will definitely purchase some more of this fabric because it is also crease resistant and perfect for travelling. I purchased 1.5 metres of this at £10 per metre and like my first top blogged about here I have enough to make another top (which I hope to do later today). This pattern has few pieces to it, back, front, sleeves and front and back facings. I did my usual FBA, which because this is a Palmer Pletsch pattern has all the cutting lines already marked on it, made it an easy adjustment. Front has two darts (not really visible in this fabric) and the whole top couldn't be easier to make - a great beginner pattern. This will definitely become a TNT pattern for me. As mentioned in my blog yesterday I have been doing some more lingerie sewing and managed to complete two bras by yesterday lunchtime. Despite the colouring in the photograph, the colour of the first bra is more of the periwinkle blue. This was some lace that I purchased from the little haberdashery shop in Walthamstow and I am really happy with the way it turned out. For this bra I used the lace for the undercup too, whereas other bras I have only used the lace for the upper cup. The pink and red rose lace was an eBay purchase and the 2nd bra I have made from this pretty lace and will be taken to the flat in London to stay there. I really find lingerie making a satisfying project (thanks to Sigrid who showed me how to do it) and I think that it will enable me to incorporate some of the techniques used, into other outerwear projects. Realy cute top Pauline and the bras are pretty. You asked me where I got the cable knit for my dress. I bought it at Fabricville which is a chain in Eastern Canada .It was very pricey at $30.00 a meter but I got it at half price. thanks for the comments Diana - your cable knit was lovely as was the dress you made. I had not seen the PR reviews of that top and now have it on my "purchase" list (like I need another pattern, lol). The neckline is perfect for me. Your fabric is darling and you look so cute! 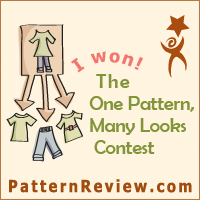 I do love that McCall's pattern! Your version is very pretty, perfect fit. Your lingerie drawer must be a gorgeous sight with all of the beautiful bras you've been making! Your top is really cute. You are also becoming a bra expert. How nice to have 2 new ones. That's a snazzy looking top, and terrific for fall/winter. I can't believe how quickly you sew Pauline. 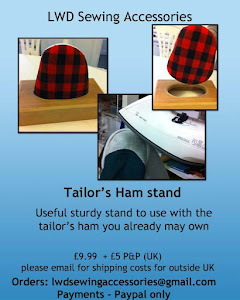 It would take me longer to choose a pattern than it does for you to choose pattern and fabric and make a garment. well Clare these are really quick pieces to make (the tops). Great outfit. It fits you so well. Just gorgeous! Your lingerie is always so beautifully made, I made my first bra this weekend and it is worlds away from yours!! I love the knit top! The neckline is so flattering. Your lingerie making skills are fabulous. You've made two gorgeous pieces there! Beautiful bras and I love your top. The belt looks great with it. Thanks a lot for sharing the McCalls 6571 reviews. Glad you were able to finish your lingerie creations! Good luck on your next projects.